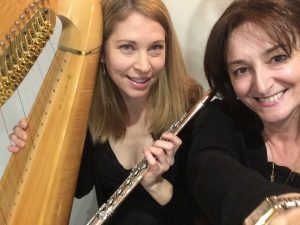 Bronwyn and Tresna recently played for the opening of the new Chapel at the Mareena Purslowe premises now situated in Townsend Road , Subiaco. The dedicated team of female funeral directors from Mareena Purslowe provide a softer, more specialised service , providing care for families in a supportive and nurturing manner. In keeping with the motto ‘A Woman’s Understanding’ Subiaco Mayor Heather Henderson was there to preside over the festivities. The team from Tres Classique performed a beautiful rendition of Ave Maria, which has a lovely melody written by the French Romantic composer Charles Gounod (arranged in 1853), elegantly superimposed over J.S Bach’s Prelude in C Major, (written 137 years earlier).